I can’t say I’m unhappy to see the end of this work week. I spent way too much time in the car visiting my students who are near the end of four-week internships they are doing in various companies. I drove from one end of Montreal to the other — in traffic, and through much construction — so far out east that I went past the oil refineries and then back across the Pont Jacques-Cartier. It’s a very exciting time for both me and my students. They get to work in the real world for a month (they have been studying print and web design for the past three years) and I get to see if what we have been teaching them is relevant. I can proudly say that they all had rave reviews from their respective employers, so I ended the week on a high note despite all the driving and traffic I sat in. In the middle of all that I tried to sketch when I had a few minutes between visits. 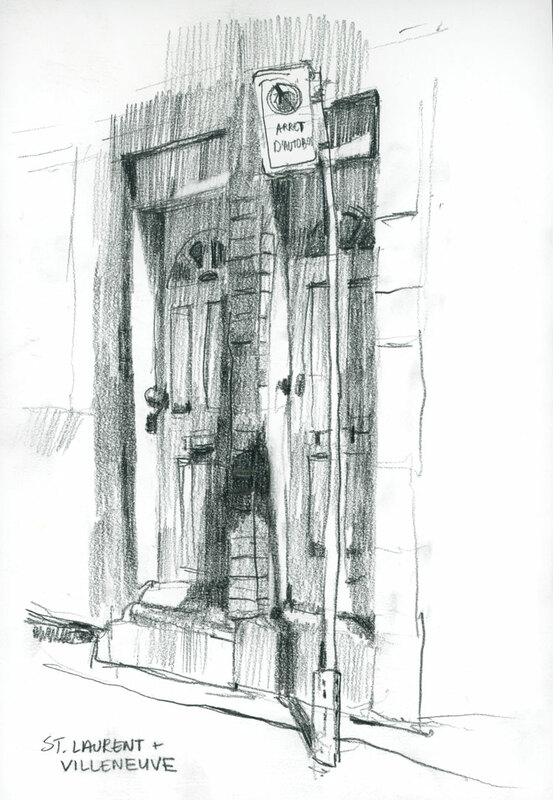 There was no time to paint but I was parked on St. Laurent today and spent some time in my car, drawing the bus stop sign, until the money ran out on my parking meter. Through all this, I got to see a multitude of places that I want to return to for sketching. In fact, I would love to plan an outing to draw a panorama of Montreal from the pedestrian lane of the bridge. Anyone game to join me? I’ve been looking for a new, inexpensive sketchbook for very quick sketches. 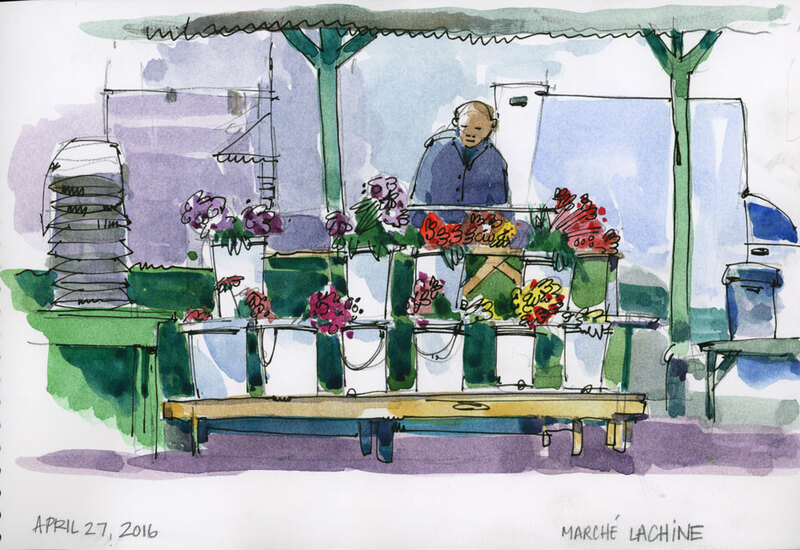 I tried painting in my Robert Bateman sketchbook (which is really for pencil drawing) while I was out in Lachine today (sketching this poor flower vendor who tried — most unsuccessfully — to sell bouquets on a really cold day). As you can see, the paper is too thin for even the lightest washes. I don’t usually add ink after wash but I did that today to see if it would help the sketch. People often ask what goes on first, the paint or the ink, and my answer is always this: I put the ink on first and paint second because if I do it the other way around I end up just outlining the colour areas (see below). My second sketch was done a little further down the road on Nôtre-Dame, and this time I used a Sharpie first and then added colour. With a stronger structure of black line, I don’t mind the faded washes. Not an ideal solution, but I like the 6″ x 9″ format so I’ll make my way through the book and then look for an alternative. I drew Alice a few days ago at about the same time as it is now (close to 5 pm). She’s patient, but one eye is slightly open, watching me, just in case I stand up from my computer. That could mean one of two things: a walk or dinner. Both are exciting possibilities for her. Sketched in the Robert Bateman sketchbook, 6″ x 9″. It’s a pleasure to draw in Montreal, a city with so much history and a vast array of choices when it comes to old buildings. It’s even nicer to draw with a purpose, with a long term goal in mind. 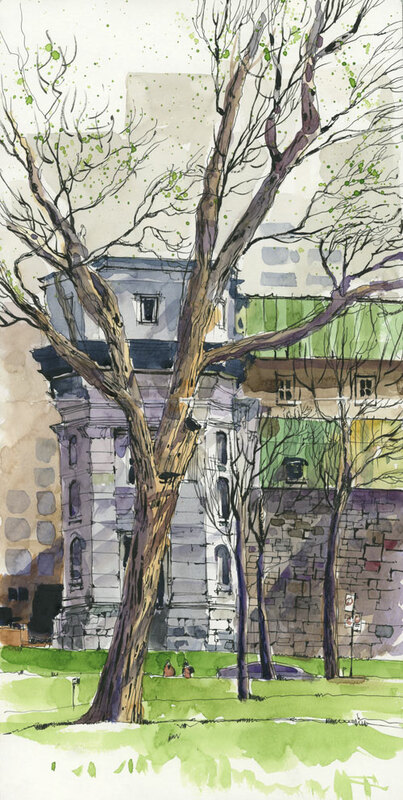 This year Urban Sketchers Montreal will be working on a project called Montréal Monument, in partnership with Heritage Montreal and in honour of the 375th anniversary of the city. We will be drawing from a long list of heritage sites, and with our partners on this project, hoping to exhibit sketches sometime in 2017. 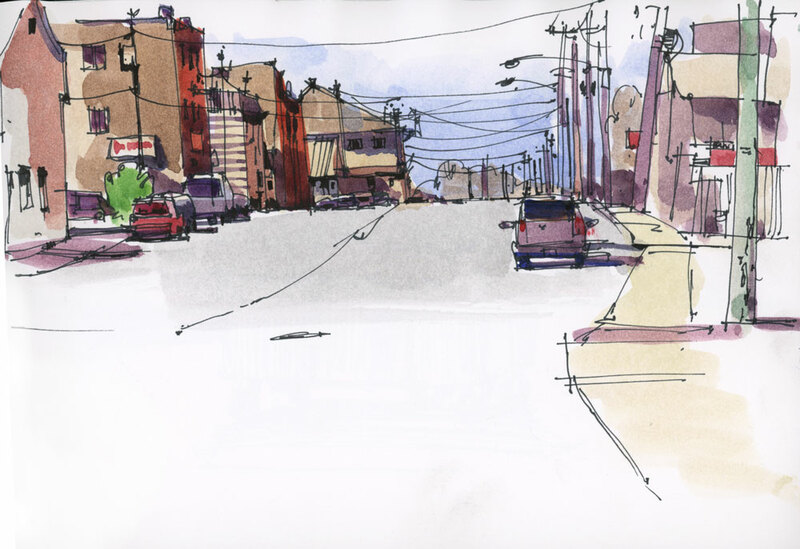 If you are interested in participating, there are lots of details on the USk Montreal website, including a Google map with locations of our sketching days for the rest of the year. 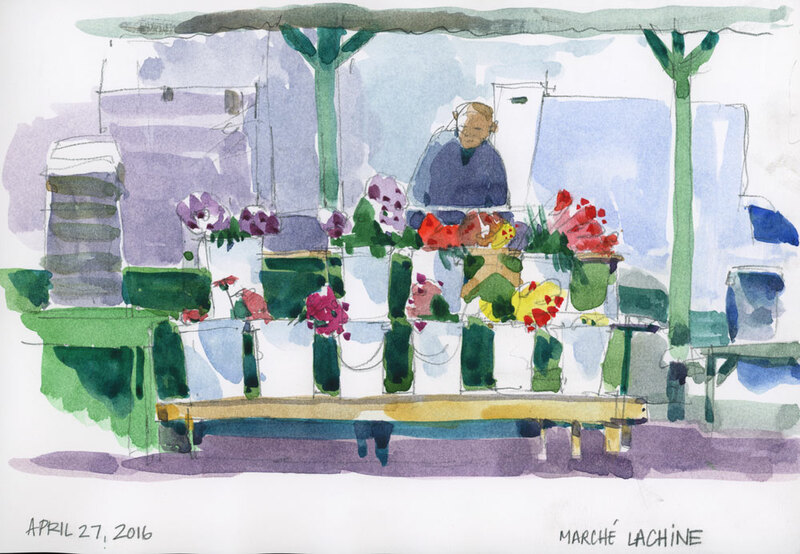 Every month when we meet there are new members who come out to sketch, so don’t be shy to join in. It’s a very welcoming group! For our first Montréal Monument outing yesterday we sketched at Place du Canada. Despite really chilly weather, we had a record-breaking turnout of sketchers. I drew a side view of Mary Queen of the World Cathedral, and even though the trees haven’t really leafed out yet, I spattered some green on the branches. Wishful thinking, I guess. Some people hate the first page of a new sketchbook. Too much pressure to do something good on it. I have friends who start in the middle of the book just to alleviate that stress. But I like that first page. It’s full of potential. Drawings that have yet to be drawn. This book is a Robert Bateman Cover Series, 6″ x 9″, made of recycled paper and quite nice for quick pencil sketches. Good for carrying around or, in this case, leaving on the kitchen counter for when you have a few minutes to spare. Today’s recipe for flowers: Hansa Yellow Medium, Sap Green, Deep Sap Green (never used it before but love how dark it is), and a few dabs of Alizarin. One brush (Rosemary Dagger, Series 772). One sheet of Fabriano Hot press paper, 140 lb. No pencil. Stir well to blend. I like to experiment with different ways of working, even if my sketches aren’t always successful. How else do you learn, right? 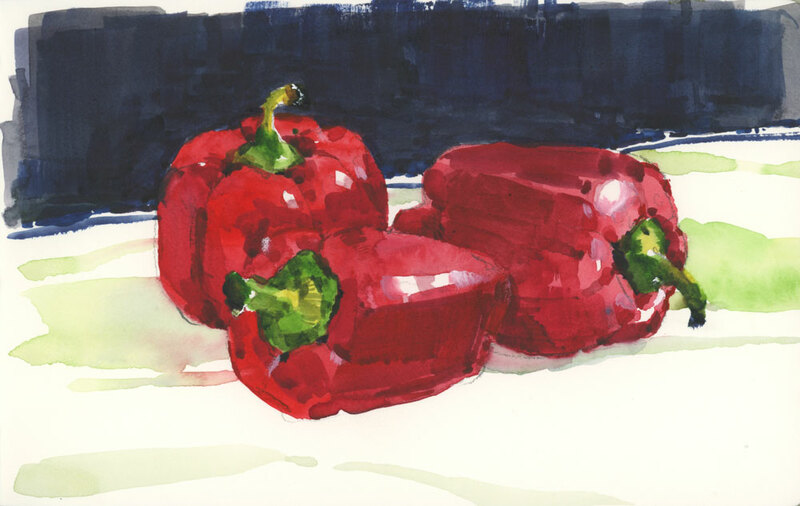 On my counter are some red peppers that need roasting, and before they hit the grill I thought I might try to paint them in a different way than usual. Instead of building up colour in layers of transparent wash, my aim was to get the intensity of the colour right in one pass, or close to it. 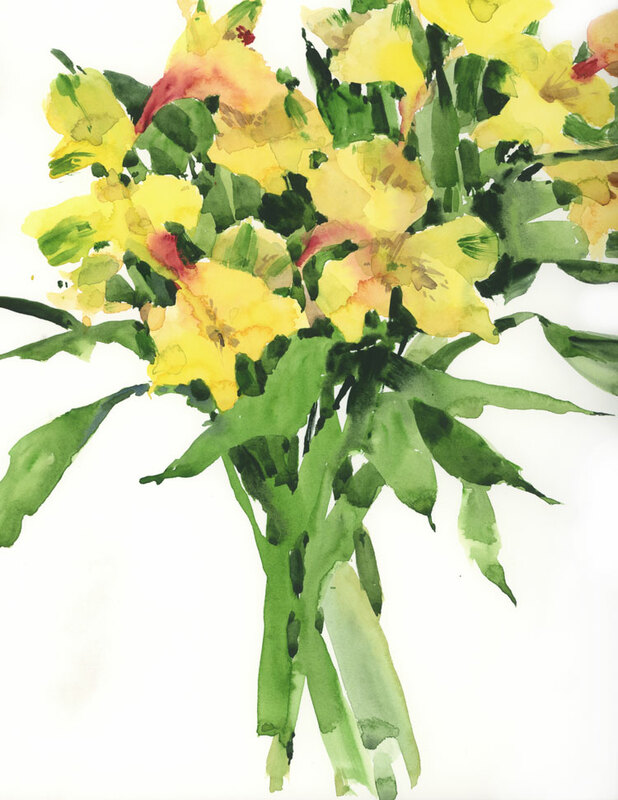 I used my biggest brush — a 1″ flat which is quite big for an 8″ x 5″ sketch. Reds are always difficult for me so I thought this might help me practice. I also tried to lose some edges, especially where the pepper shapes overlap. And lastly, it was kind of fun to use the watercolour like oil paint, thickly, in its purest form, especially on the pepper stems. 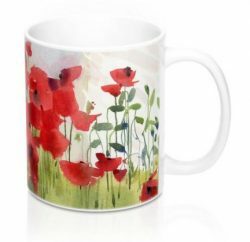 If you are game to experiment with something like this, use fresh paint for best results. If you have dried out pans of paint, it will require too much water to reconstitute the colours. And don’t forget to use the biggest brush you have so you don’t get caught up in the details. This is a good learning experience, or it was for me, and something from this exercise may come in handy in the future on a larger painting.